A family member Fung-yin has found an interesting reference citing an account on the fate of 鄭芝龍Cheng Zhi-long's personal guards, his own Black Battalion. [Readers of this blog must now already know that Cheng Zhi-long was Koxinga's father.] 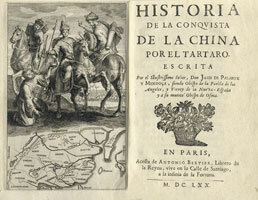 This story was recorded in a book by Don Juan de Palafox y Mendoza, entitled "History of the Conquest of China by the Tartars", translated into French and published posthumously in Paris in 1670 [see insert - title page in Spanish]. The English version appeared one year later. The Tartars of course referred to the Qing. 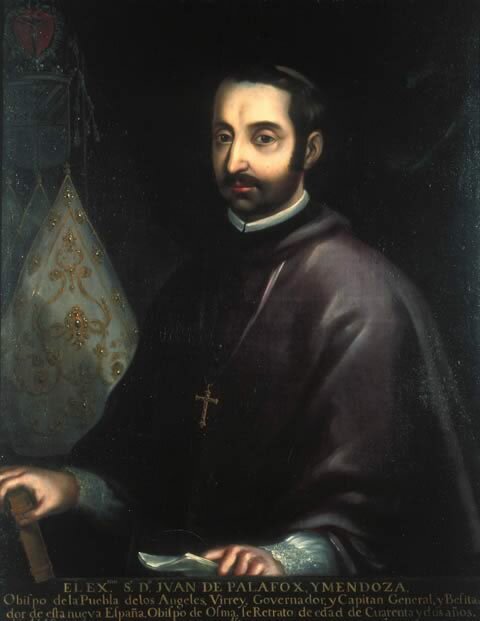 Palafox was born on June 26, 1600 in Fitero, Navarra, in Spain and later graduated from University of Alcalá and University of Salamanca in 1620. In 1629, he became a Catholic priest. He was consecrated the Bishop of Puebla in 1639 and arrived in June, 1640, in Mexico to assume the post. From June to Nov, 1642, he was the interim Viceroy of New Spain. He returned to Spain in 1649 and died Bishop of the Osma District in Soria in Oct, 1659. So how was he able to compose this 32-chapter historical tome without having set foot in China at all? Well, in the 17th Century, the China -> the Philippines -> Mexico -> Spain was arguably the most traveled East <-> West trade route. Every summer, merchant ships sailing from Manila, loaded with goods produced in China, arrived in Port Acapulco. As one in charge of the Philippine vessels and at the same time holding a high position in the Catholic Church, Palafox was regularly briefed on Chinese contemporary affairs. The information was crucial for preparing the Spanish priests leaving from Mexico on preaching missions to China. His book was based almost entirely on intelligence from Manila; it was therefore not a first-hand account. What's unique, however, is that it has details of battles between Cheng Zhi-long and the Dutch and that between the Qing armies and the remnants of the Ming forces. In fact, a whole 3 chapters (more than 70 pages) were devoted to the legendary life and adventures of Lord Cheng. And among them, a rare and precious mention of the Black soldiers. In 1646, despite Koxiga's impassioned pleas against the move, Cheng nevertheless unwisely yielded to the Qing. Some of his men went over with him that included 200 of his most loyal guards of the Black battalion - whom he had previously recruited from Macao. They, however, did not, or were not allowed to accompany Lord Cheng to Beijing. Instead, they were re-assigned to serve in the garrison army of the City of Canton (Guang-zhou). In 1647, in a pitched battle, they helped the Qing and repelled the attack by a Ming militia force. Their fearless fighting had earned the respect of the awe-struck Qing soldiers. And after the battle, the Black soldiers dropped their weapons and worshiped in a church run by the Jesuits [note: conceivably, the padres there might have been the source of Palafox's report]. While the Black guardsmen had earlier fought for their beloved Lord Cheng including battles against the Qing, Palafox, however, had incorrectly stated that these brave men survived the last battle and surrendered with Cheng. There was no such last stand, Lord Cheng had lamentably fallen victim to an elaborate Qing pacification scam. It is often said that the Qing had "set a trap to catch sparrows and caught an eagle instead". Again, no further records of their whereabouts subsequent to the skirmish in Canton. Some of their brethren had already chosen to go with Koxinga to fight the Qing and ultimately ended up in Taiwan. In 1661, Koxinga, having just been defeated in Nanjing, was in a precarious position. He had lost much territory and manpower and also lost contact with Emperor Yong-Li. The latter had escaped to Burma but it was unknown whether he was alive or dead. It was most urgent for Koxinga to re-group to continue his mission of restoring the Ming Court. 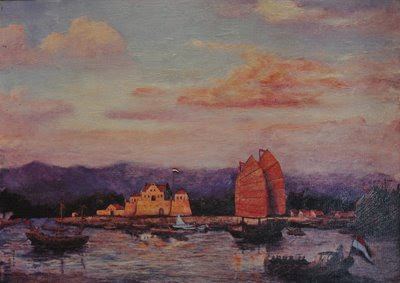 Coincidentally at that time, a interpreter-representative working for the Dutch [by the name of He Bing who happened to be from Nan-An, Koxinga's hometown, and also held a grievous grudge against Governor General Coyett], advised Koxinga then in Amoy that "Why not take Taiwan, a land of your father's? Taiwan has thousands of acres of fertile fields. It is strategically located in an area of the sea that controls the access to the four provinces. It is certainly a land to re-build your power. The red-haired [i.e., the Dutch] are ugly and stupid. They were able to stealthily occupy Taiwan only because of the turmoils in China. They are in fact quite easy to defeat." Koxinga was very pleased with the advice. In the third month, Koxinga personally led 3,200 men and sailed to 鹿耳門, gateway to Zeelandia, where the water was shallow. Normally, all ships must cast anchors here and the transportation shifted to smaller boats. This of course favored the defenders. 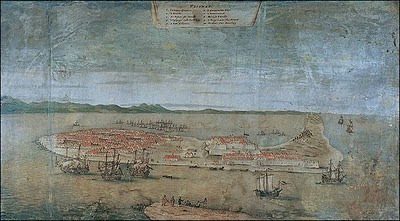 Koxinga's fleet, however, surprised the Dutch by riding the high tide with the ships in single file in queue to enter the bay and started a ground assault on Zeelandia. The fort was built of stones standing several meters tall with meter-thick walls. The walls were also reinforced with cement and were quite resistant to canon bombardment. Inside the fort, there were 1,000+ Dutch defenders who forced several thousand locals into the fort to help defend it. Coyett asked for help from Batavia. The generals there strategized that since the main Koxinga force had left Amoy which should be an easy target. And once Amoy was sacked, the siege of Zeelandia would automatically end. A fleet was quickly dispatched to attack Amoy. They were, however, beaten back by Amoy's defending army commanded by General Hong Xu. And at the same time, Koxinga heeded the counsel of the locals to cut off the sole water supply, a river that flowed through the fort. Coyett decided to counter-attack with 10+ huge warships. 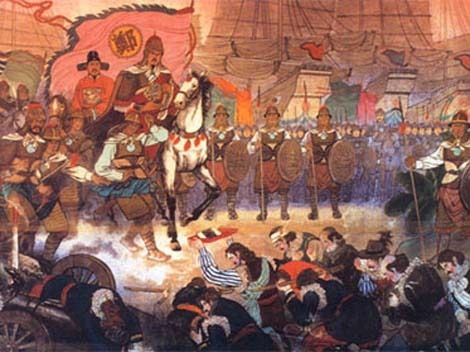 This was the arrival of 25,000 soldiers led by Koxinga on hundreds of war junks. And Lord Governor Coyett would soon find out what Koxinga's intention was. 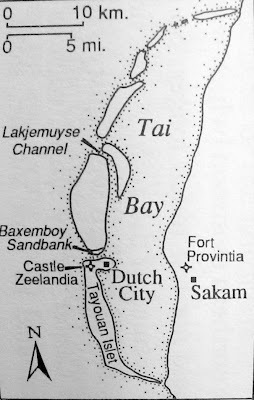 The map below shows where Zeelandia and Provintia were located. Other landmarks are: Lakjemuyse Channel = 鹿耳門 [where Koxinga's fleet entered the bay]; Baxemboy = 北線尾 [where half of 240 musketeers including Captain Pedel were slain by Koxinga's Iron-man corps]; Tayouan = 大員 [or 台灣]; Tai Bay = 台灣; and Sakam = 赤崁社 [a Siraya Aboriginal 西拉雅原住民 Settlement]. 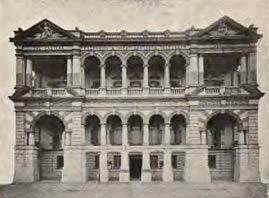 London October 13  - "The French fleet have been prevented from entering Tamsui on account of torpedos having laid across the entrance to the harbour, and in consequence of this, they have blockade the port." Hong Kong October 10 - "Later intelligence from Formosa shows that the report of the occupation of Tamsui by Admiral Lespes is incorrect. The town is still in the possession of the Chinese troops, and the French bombardment is continued daily. The local forces are strongly entrenched in the neighbourhood of Tamsui, and all efforts to dislodge them have as yet proved unavailing." Hongkong October 14 - "Intelligence has been received here that on the 8th inst. a considerable French force landed at Tamsui, Formosa. A severe engagement with the Chinese ensued, in which the French suffered heavy loss, and were compelled to withdraw and returned to their ships in port." "A London telegram gives the following version of the engagement: -- 600 French troops at Tamsui were led into a ambuscade, when 20 of their number were killed and beheaded. The remainder managed to return to their ships in safety." News actually traveled fast at that time because wired telegraphs were the main communication tool in the late 1800s. Taiwan was no stranger to the then novel tele-communications scene. In 1877, a 95-km telegraph cable system, the very first in China, was built in Taiwan [between Tainan and 鳳山Feng-shan]. In 1887, the first undersea cable was laid between Taiwan and Foochow. And the 電報學堂telegraph academy in Taipei began its first class in 1888. Battles in the Sino-French War were also greatly facilitated by cable communications especially for the Chinese. Starting in 1881, the 3,075-km land line connecting Tientsin and Shanghai [津滬電報線] was established. 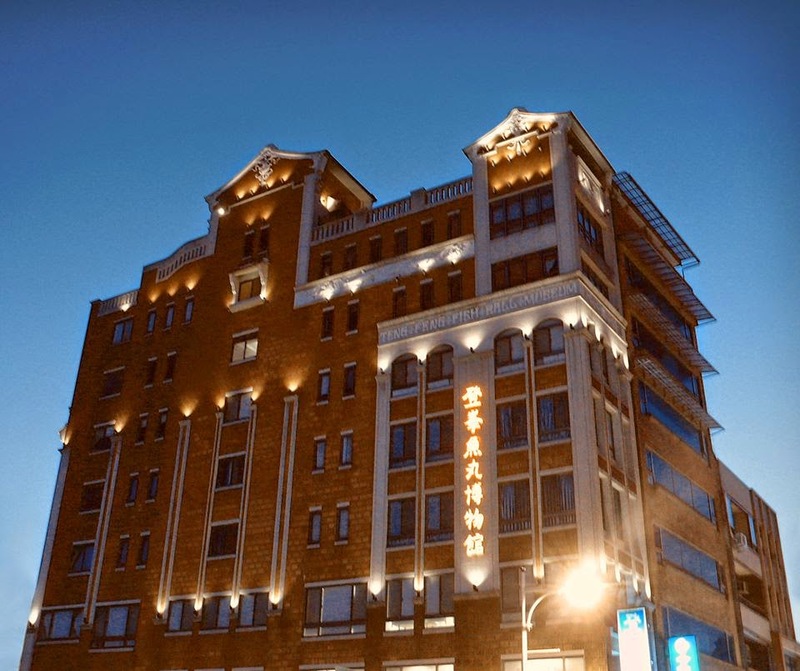 And between 1883-4, a network linking 京津, 長江, 廣州, and 龍州 areas was also constructed. This completed a nationwide communications system. With it, instead of relying on the "pony express", the to-and-fro military orders could be dispatched instantaneously. This proved pivotal in several successful campaigns against the French in Tonkin. Before the cables, the Chinese were fighting blindly especially in the beginning when the intelligence reports to the highest command in Beijing and the orders back to the field commanders took more than 50 days. Prior to this Chinese cable network, in 1868, the British had laid undersea cables from the Mediterranean, through the Indian Ocean to Hongkong. And starting in 1869 the Scandinavians (actually the Danish) took the northern route by stringing lines through Siberia to China (Shanghai) and Japan. All news reports, commercial transactions, and wired transfers were based on these cable routes.